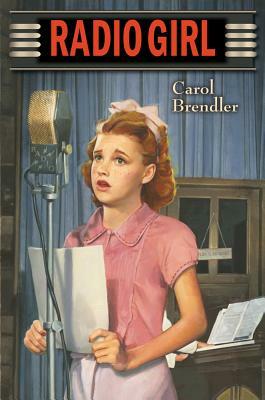 Can a girl from a middle-class Irish Catholic family living in Newark, New Jersey, in 1938 find fame and fortune (or even a job) as a radio star? Tune in to this unforgettable historical novel to find out. Poignant, often hilarious, it's the story of a family in crisis. Just as artful deception, smoke and mirrors characterize radio reality, so lies, secrets, and profound misunderstandings mark fourteen-year-old Cece Maloney's life: her secret job at a radio station, a cheating father, an aunt who may be romantically involved with the parish priest, a boy-crazed best friend, and a ham radio operator and would-be soldier both lying to their parents. The worlds collide on the night of Orson Welles's famous "The War of the Worlds" broadcast. As thousands flee in panic from the alleged Martian invasion, Cece must expose the truth about the radio hoax and confront the truth about her own and her family's dishonesty. Carol Brendler is the author of Winnie Finn, Worm Farmer, a picture book illustrated by Ard Hoyt. She has a master's degree in writing for children and young adults from the Vermont College of Fine Arts. When she was writing this, her first novel, she immersed herself in the popular culture of 1938: watching movies Cece might have seen, reading magazines, listening to music and old radio programs. She went roller-skating at an old-fashioned rink, tried to learn to dance the Lindy Hop, and continues to hunt for the best Brooklyn-style egg cream to be had in the Chicago area where she lives.